CD Rom for pregnancy, 4000 years ago ? 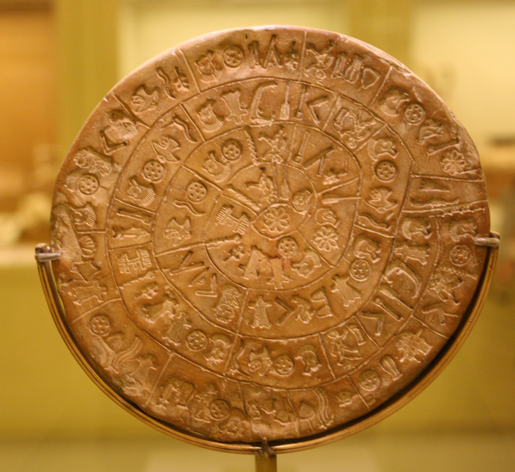 The images that adorn the enigmatic Phaistos Disc have been puzzling archaeologists for decades. Discovered by Italian archaeologist Luigi Pernier in 1908, the mysterious fired clay disk, which is thought to date back almost 4,000 years to 1,700 BC, originates from the Minoan palace of Phaistos on the Greek island of Crete. Measuring around 15cm in diameter, the disc’s unusual circular design and hieroglyphic inscriptions have proven so difficult to decipher that all attempts to interpret them have failed. The riddle of the disc however may have now finally been solved thanks to Dr Gareth Owens who has succeeded in painstakingly translating some of the symbols. The most commonly recurring symbol is now believed to mean ‘Mother’ while another translates to “Great lady of importance”. Owens, who has since managed to translate up to 90% of the disc, believes that the artefact exhibits a form of spirally printed prayer that focuses on the concepts of pregnancy and birth. Pos ini dipublikasikan di history, kanzunQALAM, picture, sejarah dan tag arkeologi, cd rom. Tandai permalink.